Fall beckons and with the new season comes another opportunity to refresh your home design. 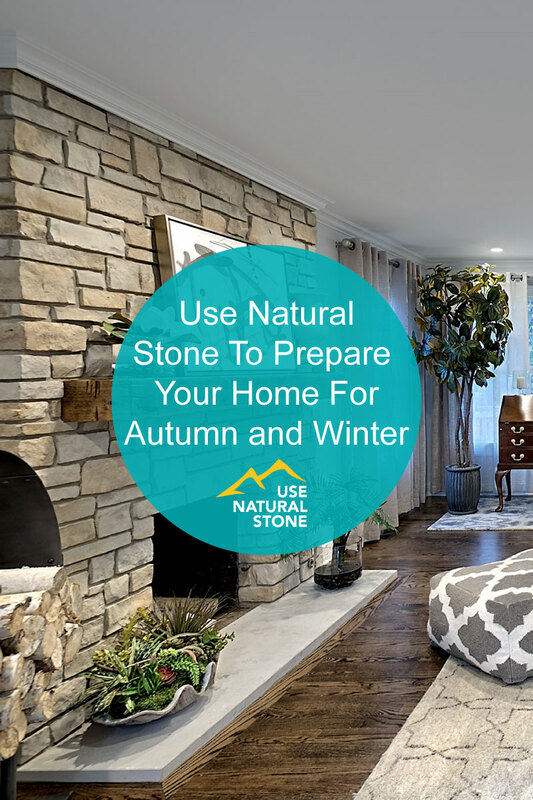 Natural stone’s versatility and ability to blend with just about any finish makes it particularly fun to incorporate fall and winter color trends into rooms featuring stone prominently. 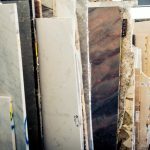 The key, experts say, is to play off the colors of the natural stone or use it as the neutral foundation from which to build a look that’s perfect for fall and winter. “When selecting fabrics and leathers to go in a space with natural stone, look to use colors that are in the stone,” advises Caitie Smithe, designer with Walter E. Smithe Furniture + Design, a fourth-generation family-owned furniture retailer that offers full service design and a showroom of high style and high quality furniture throughout the Chicagoland and northwest Indiana area. In this family room, the designers at Walter E. Smithe Furniture + Design used a multi-dimensional color of leather on the sectional that complimented the gorgeous stone fireplace mantel. 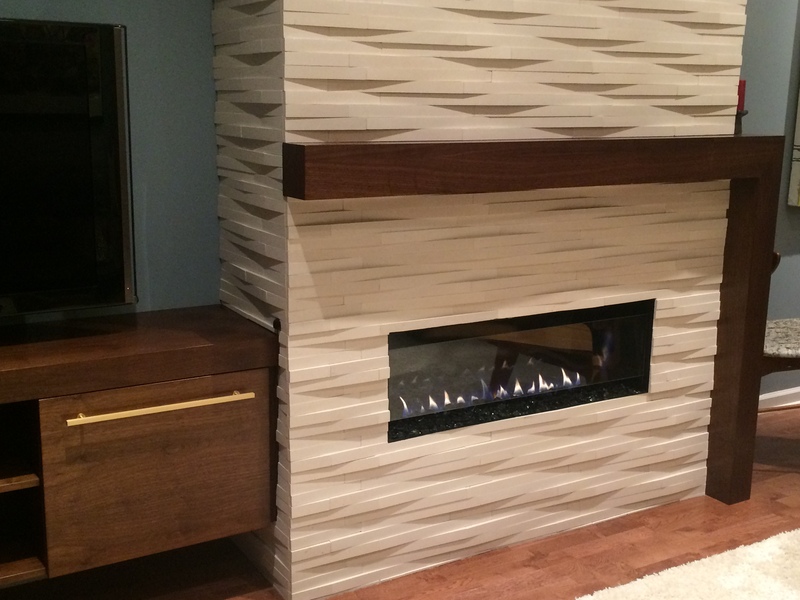 Beth Wangman, an interior designer with i4design, transformed a living room wall fireplace, previously clad with ceramic tile, into a beautiful, mid-century gem featuring natural stone cladding. 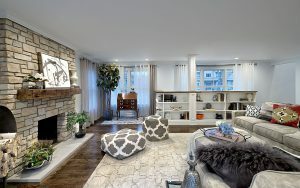 According to Beth Wangman, an interior designer with i4design, a Chicago-based full-service residential interior design firm that believes that interior design is the art of blending form and function to enhance their client’s lives, is noticing softer color palettes returning to the design forefront. “Pale grays, pale blues and whites are all making a comeback in kitchens, living rooms and bedrooms alike,” Wangman says. She also notes that because her clients are drawn to the rustic, reclaimed and industrial look, they’re interested in furniture, lighting, fireplaces and design that incorporates those elements in modern design. 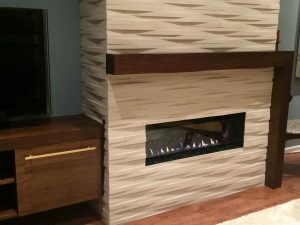 For one project, she transformed a living room wall fireplace, previously clad with ceramic tile, into a beautiful, mid-century gem featuring natural stone cladding. “The juxtaposition of the honed white stone, the linear fireplace and the custom walnut media center and mantle bring perfect balance to the space,” says Wangman. When designing, Wangman also considers how to incorporate using reclaimed and natural elements throughout a home. In this West Bend, Wisconsin, home, she incorporated a linear fireplace with Moose Mountain drystacked stone from Halquist Stone to hit that rustic modern look. 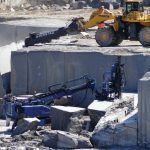 Nature has a way of helping us feel more connected and grounded, which is among the reasons natural stone is often used for fireplaces in living rooms or on the floors of entryways. When designing, Wangman often considers how to incorporate using reclaimed and natural elements throughout a home. One of her favorite bedroom and home projects is located in West Bend, Wisconsin, in which she took used both reclaimed and natural elements in the final design. “Beams from demolished Wisconsin barns were featured throughout the home,” she shares. “Reclaimed brick from a local West Bend church and antique ceiling tins from a Chicago bar were incorporated in the lower level bar area. 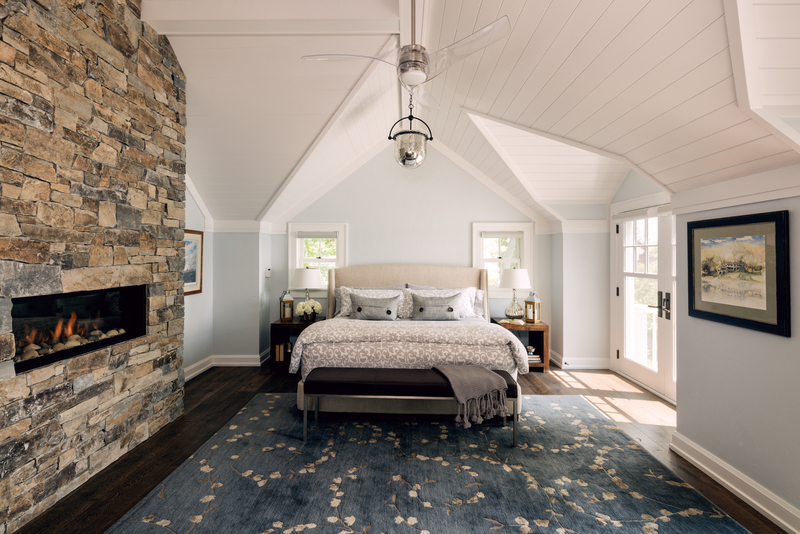 The lake view master bedroom features an inviting linear fireplace with Moose Mountain dry stacked stone from Halquist Stone.” It’s their take on the rustic modern look. In some cases, the idea is to highlight the beauty of natural stone inside the home. For one family room, the designers at Walter E. Smithe Furniture + Design used a multi-dimensional color of leather on the sectional to compliment the gorgeous stone fireplace mantel. 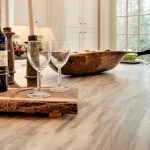 As fall and winter nip at our heels, it’s important to remember that it is unnecessary to overhaul your entire home to take advantage of appreciating your natural stone features. Simply adding small additions, such as natural fiber baskets, handmade textiles and beautiful wood or stone pieces is an easy way to make a space feel more inviting. Rebecca Crall, founder of Territory, a collaborative design company and online shop which brings to market a mix of original designs, vintage pieces and curated goods, notes the strong trends of Desert Southwest and Warm Minimalism, which often incorporate natural elements. “Natural stone, along with wood and textiles, bring the outside in and allow us to relax in our space,” says Crall.